I seem to be in a bit of a North Bay rut! 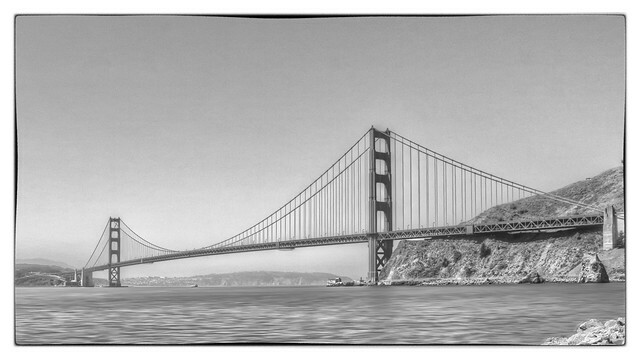 Here’s another black and white image from the Marin County perspective north of San Francisco. This is the Golden Gate Bridge from Fort Baker, a truly delightful – and usually lightly visited – spot on the north side of the Golden Gate. Click on the image to see the light boxed version. You get some unusual perspectives from this location – of both the bridge and also of The City itself (see this wonderful nighttime shot of The City that my friend Doug Kaye took from Fort Baker during a full moon recently). Behind me when I was taking this shot is Carvallo Point, a very pleasant lodge and restaurant (Murray Circle) that uses many of the old buildings from Fort Baker as its rooms.This image is from my original DSLR, a Canon 30D that I purchased in 2006 and long since sold. It was shot on May 13, 2007 using the original 17-50 mm kit lens that came with the camera at ISO 100 and wide at the 17mm focal length. It was taken hand-held – I didn’t even own a tripod back then! The exposure was 1/400 at f/10. I’m sure the camera was in P mode – as back then I pretty much didn’t know how to use the other modes. In terms of post-processing, I first ran the single image RAW file through Photomatix Pro – playing mostly with the Lighting Adjustment slider to move the brightness of the sky around to my liking – mostly over the south tower of the bridge. I tried to minimize the all too common HDR halo – and just have a bit brighter sky at that end of the bridge to pull your eye over in that direction. I then brought the tone mapped image into Photoshop CS5 and applied a series of filters. First, I used Motion Blur in Photoshop along with a layer mask to soften the water. Then Nik’s Dfine to bring down the noise in the sky a bit. I also needed to use the Spot Healing Brush to deal with about a dozen sensor dust spots in the sky. While the image was still in color, I ran it through Viveza to add a bit of structure and then Color Efex Pro 3.0’s Tonal Contrast to add further definition. I then applied Nik’s Silver Efex Pro 2 and converted the image to black and white, applied a bit of CEP 3.0’s Polarization filter, sharpened in Sharpener Pro 3.0 before a final pass through Silver Efex Pro 2 to add the border. All told, this took about 20 minutes of tweaking, adjusting, etc. to get to this final result. I’m thinking this black and white might join a few others I’ve been working on in a set of note cards that I could use or give as gifts. Meanwhile, hope you enjoy it!